Sacramento, the capital of California! Did anyone else not know this? Just me? That’s BAD considering I claim to be this travel expert and all. Excuse me while I go study up on all the state capitals…. I just came back from yet again, another 3 day weekend get-away. At this point I should really change my name to “My Perfect 3 Day Weekend Itinerary.” They are just so refreshing, motivating, and cost-friendly! There is not too much to do in Sacramento other than drinking-filled activities. So if you are not a drinker – this itinerary is not for you, sorry.. I spent the day wine bar hopping along downtown and old town Sacramento. There are so many wine regions just outside of Sacramento like Clarksburg, Lodi, Napa, Sonoma, Amador, & El Dorado. If you lack the time or the funds, Sacramento is the perfect hub to taste a little bit of everything. I honestly can not say enough nice things about this shop + owner! Raymond James just opened a few months before we arrived, but you definitely couldn’t tell. Studying in Champagne France, his champagne options were top-notch and my favorite part, never too sweet! I ordered the ultra luxurious, “Baller” flight, which included Dom Perignon, Veuve Clicquot, and Krug Grande Cuvee! All this paired with a charcuterie board and oysters. We planned on only coming for one flight and ended up staying for two more glasses, because, what could be better than this place? The Underground is in old Sacramento, which is the most adorable area. Definitely worth spending an hour strolling along the river and hopping in and out of local shops. We stopped at the Twisted Twig Winery that is located “underground.” It has a classic, Italian style with brick walls, wine barrels, and vines along the posts. Makes for the perfect photo-opp! The wine tasting includes 10 wines – YES, 10! The wine was so-so, but I wouldn’t say amazing. This is more of a stop for the adorable atmosphere. 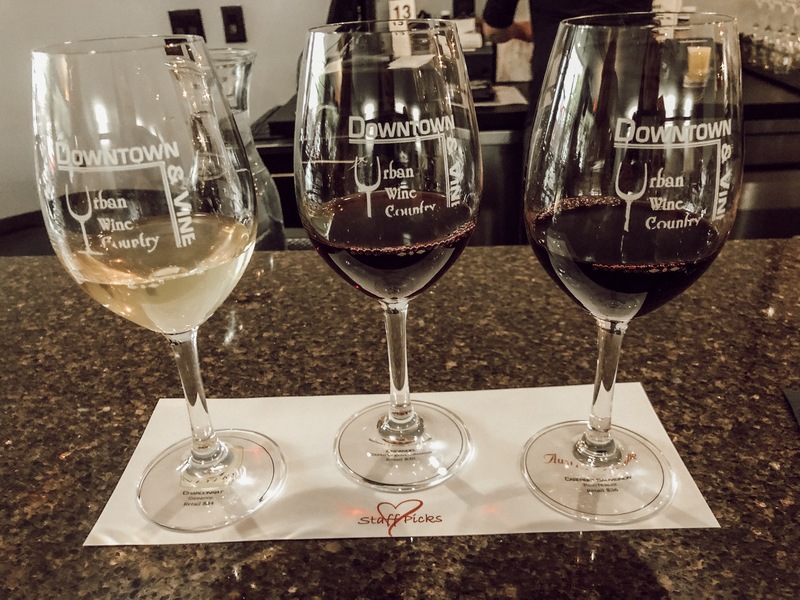 Downtown & Vine is a very large and modern wine bar, that has a large room for events and live music. The red wine was very good at this stop, white was a little too sweet for my taste – but that’s also expected from me! I got the flight of three, one white and two reds. They give you fairly large pours, at a fairly affordable price! Sooo.. I didn’t take any pictures at this stop because, well. It was the fourth stop. Also a very clean, modern and upscale wine bar. 52 Degrees had an amazing food menu here too, so come hungry! The wine was the best here, so I would keep this one as your last stop. Last, but certainly not least: Make your way over to Sauced for some of the best BBQ of your life and a much-needed nap after all that wine! What a fun day! I love the idea of going wine bar hopping. I usually only drink the sweeter wines but it’s about time I branch out!